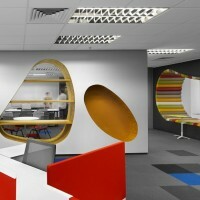 M Moser Associates have designed the first corporate office in Asia for Sherwin-Williams, located in Kuala Lumpur, Malaysia. For many companies, establishing a new office in a young market often also entails going the extra mile with workplace design. In everything from detail to architecture to technology, the new environment can depart from the corporate norm to accommodate the working style, culture and expectations of local staff, or just to make a strong ‘first impression’ of brand values. 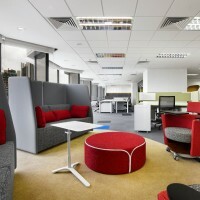 Or indeed, a new office can embody all these qualities. 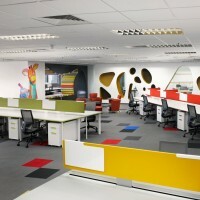 When Sherwin-Williams, one of America’s major paint companies, decided to open a shared service center in Kuala Lumpur, Malaysia, the firm was highly conscious that it would also be its first corporate office in Asia. The space would therefore need to be something different, both in how it accommodated its users, and how it would define the brand in a young market. 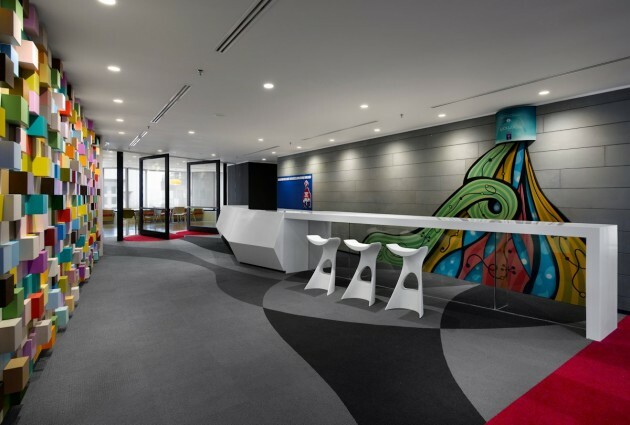 All this new design thinking would be applied to the 28th floor of the Vista Tower at Jalan Tun Razak, a relatively old building that had recently undergone refurbishment. Extensive though the renovations were, some inherent quirks of the building’s architecture were left unchanged. Among the most intrusive – at least in relation to fulfilling the project brief – were the twin cores at either end of the rectangular floor plate, the double row of thick columns running several feet inboard of the floor plate perimeter, and the ‘scalloped’ edges of the floor created by its bay windows. Fusing architecture to function & brand – Despite the 11,500 sq-ft floor’s somewhat narrow proportions, the designers were able to create a layout that is anything but a numbingly linear succession of spaces. By necessity, the reception area is located at one end of the office, adjacent to the lifts in one of the building’s twin cores. But with no need for extensive seating, the space could be kept relatively compact, leaving room on either side of its long, V-shaped desk for a sizeable boardroom and staff lounge/pantry. “A key thing is that when you walk into reception, you have these glass walls and transparent pivot doors on either side leading to the boardroom and staff lounge. Instead of being confined in a small, gloomy space, you can look right through into the next space, and enjoy the view outside as well,” Ramesh explains. 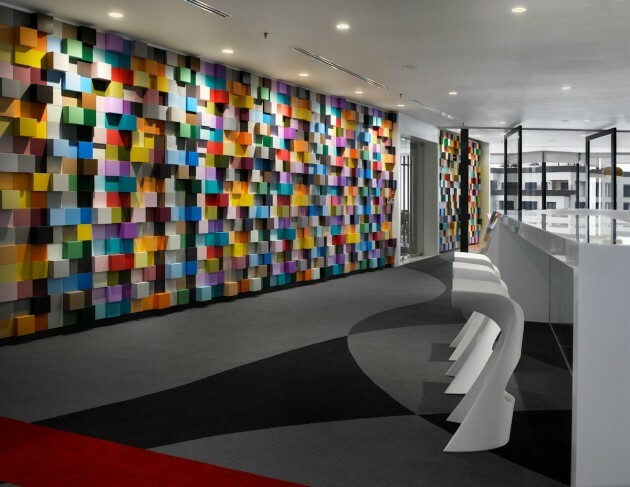 Meanwhile, the view inside is electrifying, with streams of multicolored paint seeming to pour down the grey wall behind the reception desk. 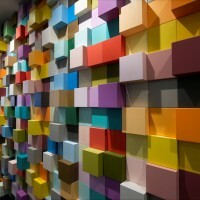 The opposite wall takes the form of an irregular cubist sculpture with each cube bearing a different color from the Sherwin-Williams paint palette. “The wall has 20 different colors – we deliberately used every major color group of paint Sherwin-Williams makes in the region,” Ramesh reveals. 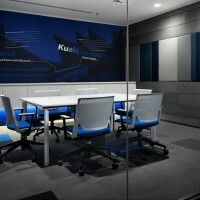 Progressing deeper into the office brings yet another vibrant punch in the form of a pair of glass-fronted meeting rooms located directly behind the reception desk, respectively decked out in corporate blue and red. In the boardroom nearby, the chairs repeat the same colors in four pastel shades, reinforcing brand identity while providing a note of visual cohesion amid the riotousness. The work floor: Open & unexpected – A transparent glass door inset into a section of transparent glass wall separates the office’s ‘public’ areas from the main work floor. 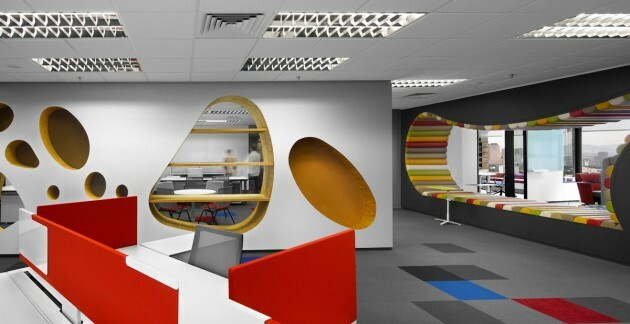 From the designers’ point of view, the latter was particularly challenging, requiring an open-plan area with enclosed manager’s offices and break-out zones to be somehow integrated into a space obstructed by columns. One part of the solution was to cluster all three of the manager’s offices near the center of the floor plate so that they adjoin the meeting rooms in the reception zone. By packing most of the enclosed spaces into tight ‘core’, the rest of the area could be kept relatively uncluttered, flowing and flexible. The intrusive columns were meanwhile either hidden (as in the pantry and boardroom), or transformed into decorative features with a wrap of graphics. Two more pairs of columns were transformed into eye-catching benches by filling the gap between them with an undulating floor-to-ceiling loop of multicolored upholstery. 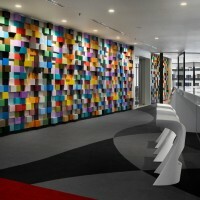 In most offices, color is merely an aesthetic component, added to complement the architecture of the space. 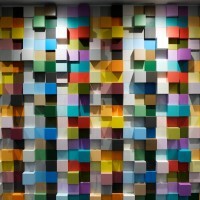 Here, however, it is truly a defining element of the design, much as it is a defining element of Sherwin-Williams. 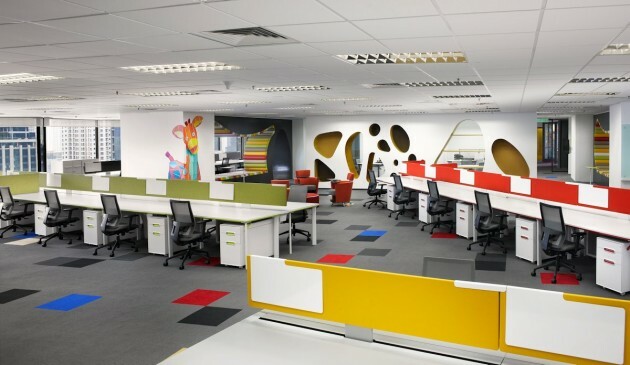 One’s first impressions of this office are also the most lasting ones: of vibrant brightness, creativity, and diversity united to a single purpose.